It’s been quiet on the VMC front over the last few months, but the good news is that our next VMC observation is scheduled for mid-May. However, don't think we haven't been busy behind the scenes in the meantime! 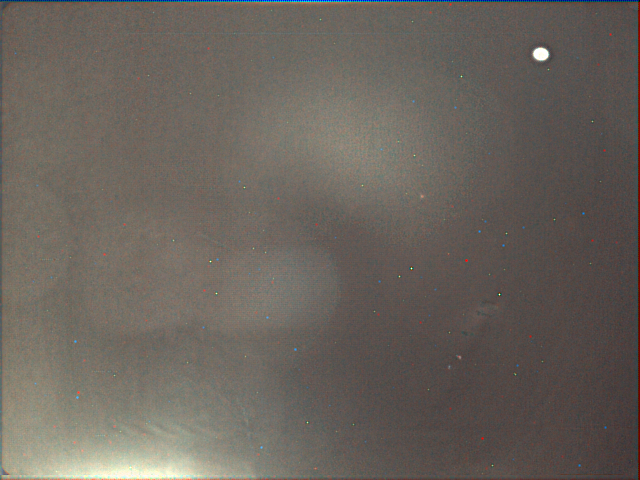 In the summer of 2013, with the prospect of comets ISON and Siding Spring passing by Mars over the next 12 months, we wanted to have the ability to image them with VMC (if we got the opportunity). VMC has two operating modes: line mode and frame mode; the main difference between these is the image exposure times that can be set. Line mode gives a maximum exposure of 200 millisseconds, and frame mode ranges from 200 milliseconds up to 95 seconds. The original on-board control procedure (i.e software commands) that operates VMC was only able to use line mode. This was a deliberate decision when the procedure was created to keep it as simple as possible, and 200ms is more than adequate for taking pictures of a well-illuminated Martian surface. 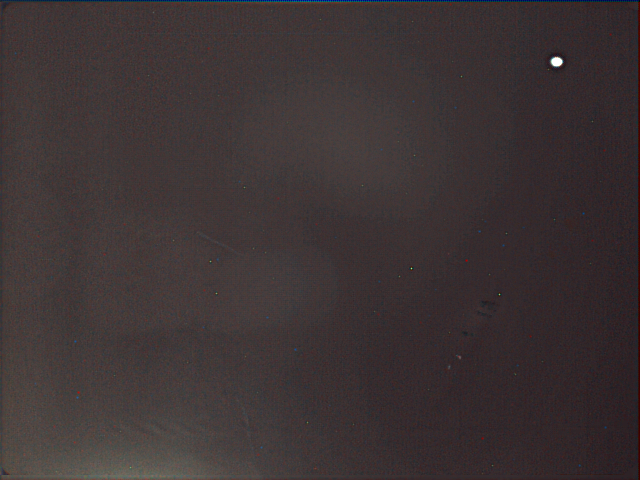 However, attempting to capture something as faint as a comet with a 200ms exposure on a 640x480 camera with no fancy optics was clearly going to be impossible. Thus the team decided this would be a good opportunity to perform a software upgrade that would enable us to operate VMC in both modes. Following a redesign of the algorithm, recoding and a period of validation against the spacecraft simulator, the upgraded procedure was uploaded to Mars Express. Once on board, the final step was to use it operationally. A set of test images would be have to be taken and for this we needed a suitable target. The target had to be something bright enough that we stood a chance of imaging it but faint enough that we would likely be unable to see it on a short exposure. This was tricky given the limited number of test opportunities we had, but to our surprise and delight we discovered that Mars moon Phobos would pass through our field of view during the last of the slots we had identified . Given that the last time long exposures were used on VMC was in 2007 (then just as a test to check it still worked) we had little information to go on regarding what exposure settings to use. The choice was further complicated by only having enough time to take 3 images. In the end we decided on a large spread with 13-second, 6-second and 2-second exposures, as these would give us a good chance of capturing Phobos whilst also allowing us to assess the performance of the camera. It was a tense wait to get the images back and see if all our work had paid off. Turned out we needn't have worried: not only had the upgraded software worked perfectly, but VMC had taken its first direct images of Phobos! We were absolutely thrilled with the results. We estimate that we were approximately 8000 km away from Phobos when the images were taken (the increase in size/brightness is due to the different exposure times used). The 13-second and the 6-second images are a little over exposed (the glow in the bottom of the images is the light from the day side of Mars). 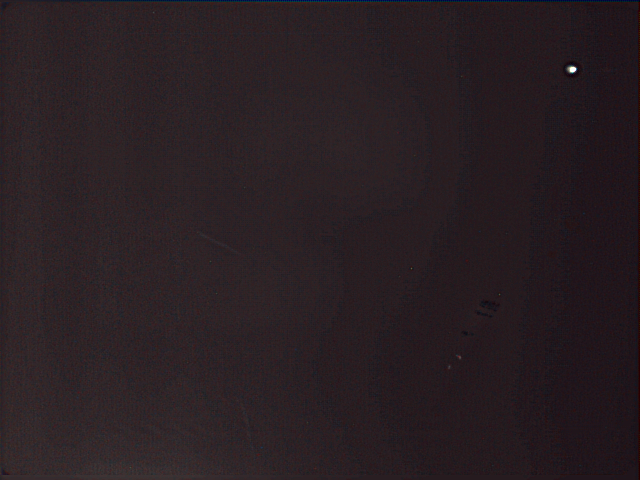 In the final image (a 2-second exposure) it is possible to get some indication of the overall shape of the Martian moon. Putting all images together in an animation, Phobos can be seen moving across the field of view. 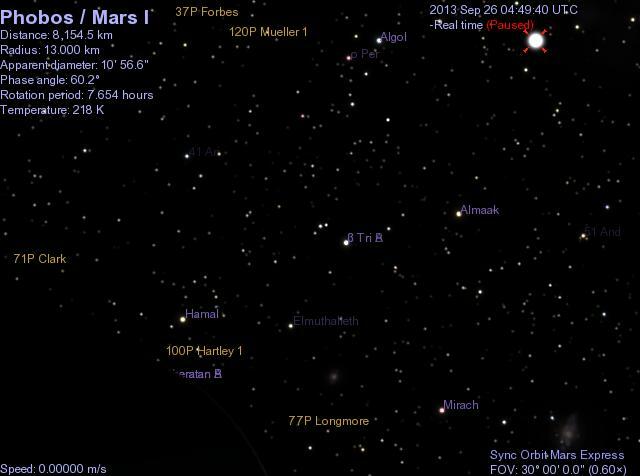 Unfortunately, our follow up observation of ISON did not go as well as we'd hoped. In the end, it was not as bright as originally expected and simply too faint to detect even with longer exposure times. All was not lost though, as we were left with these great shots of Phobos and new and proven imaging opportunities for VMC!